For the first time in several years, the global forecast for mining was looking up, according to a speaker at VMA’s 2018 Market Outlook event, held in August 2017. According to the NMA (National Mining Association) The strength and future health of the U.S. economy depends on mining, which provides the building blocks for the everyday American experience. Mining supports nearly two million high-paying jobs and contributes to economic activity in every state. Many of our most valuable resources are buried deep in the earth. It takes a lot of power to extract these minerals and fuels so that we can use them for our day-to-day lives. Hydraulics make this extraction possible in a safe and efficient manner. In North America, 85% of our mining is surface mining. Surface mining is a mining process where the overlying mineral layer (called the overburden) is removed, and then the mineral is removed using tunnels or shafts. Surface mining is a two-part process, and both processes involve the power of hydraulics. Powerful earthmovers remove the overburden, allowing access to the minerals. Then gigantic excavators extract the minerals from the earth. Even transporting the materials from the mining site to the processing plant requires hydraulics, as articulating dump trucks are used to collect and transport. 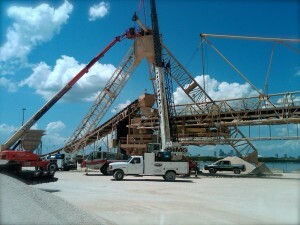 Large scale operations like mining require equipment that is reliable and safe. These hydraulic cylinders are doing very powerful work, and they need to be able to hold up to the pressure put on them. Hydraulic systems and parts are found in a several equipment types including drills, conveyors, loaders, rock bolters, belt crushers and more. REPAIR, REMANUFACTURE OR EXCHANGE TO PROTECT YOUR BOTTOM LINE. Lightning Bay Pneu-Draulics knowledgeable team of industry professionals will work with you to isolate any problems and deliver the right solution for your needs. We know that time is money, and that every moment you cannot properly use your equipment is money down the drain. Our team will provide you with fast service and reliable quotes in an effort to mediate your problem as quickly as possible. 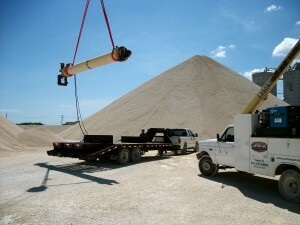 Lighting Bay Pneu-Draulics is Florida’s leading provider of hydraulic services to the mining industry. We have the equipment, personnel, and experience to deliver on-site and off-site hydraulic services to the highest industry standards. From local to worldwide we test, troubleshoot, install, remanufacture, and redesign hydraulic cylinders, gearboxes, valves, winches, and more. Our capabilities surpass others and our fabrication is completed in-house. Our technicians are Fluid Power Certified through the International Fluid Power Society and are on-call 24/7 for emergency or scheduled maintenance. Service trucks w/ cranes are equipped with a torch rig, air service, welding equipment, fittings, adapters, flow meters, standard & Metric seals, etc. Our mobile service trailer is equipped with industrial hydraulic hoses, fittings, adapters, hose crimpers, and tube benders. With offices in Tampa, FL, and Jacksonville, FL, Lightning Bay Pneu-Draulics offers superior service in the maritime, industrial, manufacturing, machining and construction fields. Our main goal is to meet the customer’s demands in a timely and efficient manner while keeping their bottom line in mind. How can we assist with your mining and industrial equipment repair needs? Call us at (813) 655-0806, email info@lightningbay.com, or fill out the contact form to get more information.